Miss M. helped me decorate the tree. 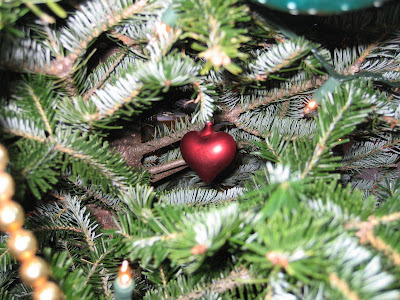 When I unboxed the red glass heart, she wanted to hang it buried deep within, the heart of the Christmas tree. oh god, is that ever touching! That is the sweetest thing EVER! :) We hide a little Christmas pickle ornament every year, and the kid who finds it on the tree Christmas morning gets a special gift! awwwwwwww that is so sweet! I love this. Way better to hang it in the middle of the tree. V. clever, Miss M.
jeez, I just snorted back a tear. What a lovely sentiment. And I think I would have trouble with totally wordless wednesday too. I'm with everyone else...so sweet! That is so sweet! Reminds me of the time I took my son to Build A Bear. Usually the kids takes the bear "heart" and buries inside the bear. Not my kid - he wanted that heart sewn right on the skin of the bear. Wearing his heart on his sleeve, as it were. I love, love, love that ornament! Damn, I'd love to meet that remarkable Miss M.
So smart! That is precious!